Speaking at the opening ceremony of the Exhibition "Development of Human Rights in China: 40 Years of Reform and Opening-up," Yu Jianhua, head of the Chinese Mission to UN at Geneva, said that guided by the people-centered philosophy, China puts the interests of the people above all else in its efforts to promote the human rights cause. "Based on a clear understanding of the national conditions, China recognizes both the universality and particularity of human rights and promotes the balanced development of economic, social and cultural rights and civil and political rights," he noted. "Committed to promoting human rights through development, China pursues innovative, coordinated, green, open and shared development and earnestly implements the United Nations 2030 Agenda for Sustainable Development," he added. Li Xiaojun, an official from China's State Council Information Office, also addressed Monday's opening ceremony of the exhibition and explained the tremendous role of the reform and opening up in promoting the development of China's human rights cause. "China has made poverty reduction a priority in the promotion and protection of human rights," he said. "On average, China has been lifting more than 1 million peasants and herdsmen out of poverty every month in the past several years, which should be considered as a miracle in human history." 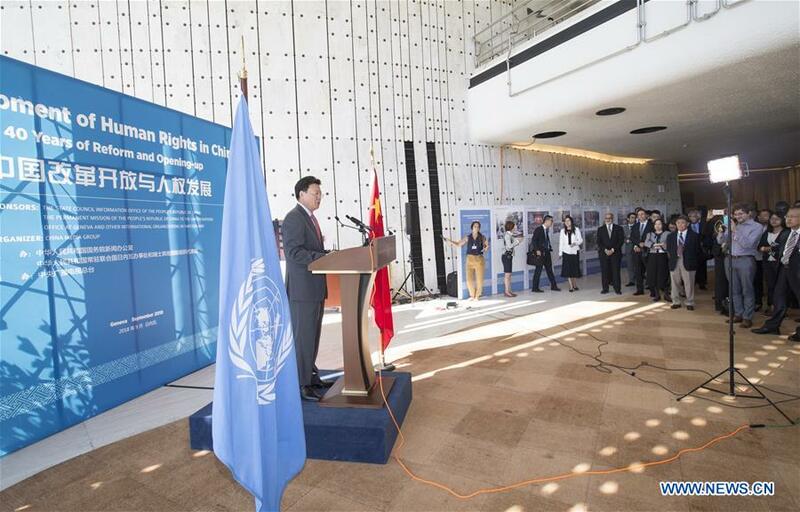 The exhibition, launched on the first day of the 39th session of the UN Human Rights Council, was jointly sponsored by the Chinese Mission to the UN at Geneva and China's State Council Information Office. The exhibition displayed some 90 pictures and 15 short videos about China's progress in human rights since it introduced the policy of reform and opening up 40 years ago. "Following this visual guide, you will develop a full picture of how far China has come in human rights development, which can be seen everywhere in our economy and society," Yu told an audience of about 600 people at the opening ceremony. According to Yu, China has met the basic living needs of its 1.3 billion-plus people, lifted more than 700 million people out of poverty, realized the universal coverage of nine-year compulsory education, and developed the world's largest universal health care coverage system and the largest social security system. In addition, he said, China is also fully involved in global human rights governance and advocates a new form of international relations featuring mutual respect, fairness, justice and win-win cooperation. "Committed to promoting human rights through openness, China keeps opening up the country, which not only serves our own development, but also allows China to live up to its responsibility as a major country and share its development experience and opportunities with the rest of the world," Yu said. Forty years ago, the Communist Party of China (CPC) made a series of important decisions on reform and thus made a landmark policy shift at its plenary session held in December 1978, which marked the beginning of China's drive of reform and opening-up.